Noah’s expertise in financial planning and investment management provides his clients with tailored guidance and customized strategies, with an emphasis on comprehensive wealth management. As a Registered Principal his responsibilities include management of operations and compliance for Kendrick Wealth Management. Noah began his career earlier than most, having earned his securities license while still in college. 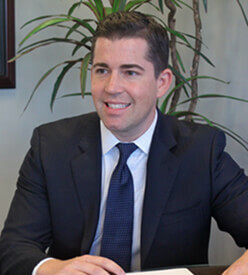 Prior to establishing Kendrick Wealth Management, Noah spent 10 years as an advisor with Edward D. Jones & Co., where he became a limited partner of the firm. Noah is a graduate of the University of Akron, having earned a bachelor’s degree in business management followed by a graduate certification in financial planning from New York University. Noah has earned the prestigious CFP® certification, one of the most respected financial planning credentials among consumers and the recognized standard of excellence in personal financial planning. In addition to becoming a Certified Financial Planner™, Noah has obtained the Accredited Asset Management SpecialistSM designation, AAMS®, recognized by the College for Financial Planning. Noah and his wife Meghan, live in Cave Creek, Arizona, with their two children, Tyler and Sydney, and the family dog, a golden retriever named Josie. Active in the community, Noah has served in various leadership roles, including president of the board of directors for the Carefree Cave Creek Chamber of Commerce, and as a member of the executive board for the Foothills Community Foundation. When not in the office, Noah enjoys time with his family, golf, and most anything outdoors.